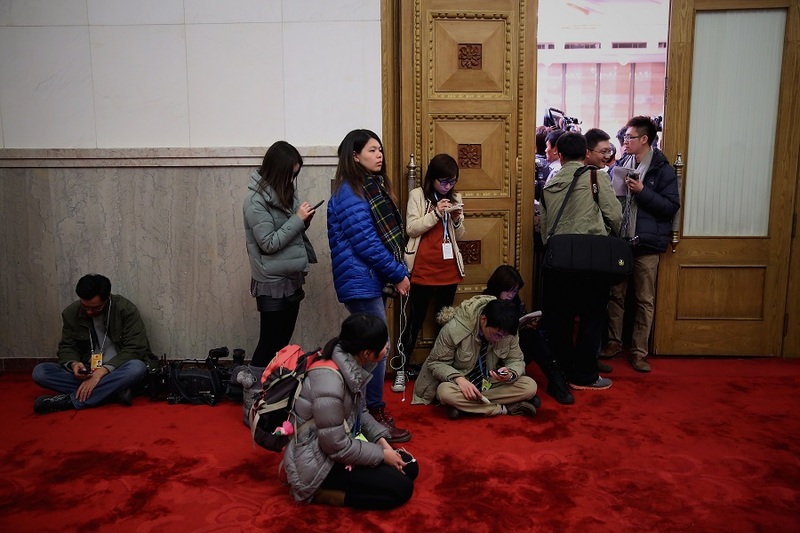 Journalists have to stand outside the crowded press conference room for the Chinese People’s Political Consultative Conference (CPPCC) at the Great Hall of the People in Beijing, March 2, 2013. Six years ago as I was about to begin my undergraduate career at The University of Iowa majoring in journalism, a fellow Chinese student who’d switched her major from communications studies to business ruthlessly doubted my choice. Harsh as she sounded, she had a point. For two months last summer, I lived in a state of constant worry and stress. I was on a full-time internship in New York while completing my Master’s in journalism at Northwestern University. I spent nearly all my spare time applying for jobs, networking—something I had to force myself to do—and going on job interviews. It was profoundly depressing. I felt up in the air while the time ticked away. At night, I’d dream of job offers—strangely, not rejection letters—and even more strangely, the Federal Reserve short-term interest rates. On weekends when I was too antsy to stay in my Harlem sublet, I’d flee to my neighborhood bakery and devour their massive dark chocolate chip cookies; and I don’t even like cookies. I had studied journalism as an undergraduate at the University of Iowa. I’d heard of its prestigious Writer’s Workshop, but I didn’t know much about the school when I applied. I didn’t care that it was surrounded by cornfields; I just hoped I would save my parents tuition money by avoiding private schools on the coasts. Journalism was an unpopular major among Chinese students (and among all international students). I chose it because I was curious about American society and culture and hoped it would help improve my English. Shortly after I graduated, I returned to China to work for an international news organization’s Beijing bureau. I started out as a news assistant, a common job title for Chinese nationals working for foreign news outlets, often dubbed “Chinese secretaries,” or “zhongmi” in Chinese. I didn’t just do secretarial work; I was able to report, write, and produce with colleagues whom I enjoyed working with and respected. I loved the job and worked hard at it, but it also frustrated me profoundly. I faced pressure, hassle, disappointment, and sometimes fear because of my citizenship. Eventually, there was basically no room for me to grow past the “assistant” role in the foreign media system. I also worried the job would become even riskier as civil society continued to deteriorate in China. Even though I knew at the time my foreign status would largely exclude me from employment at American media outlets, I decided to return to the U.S. to study journalism as a graduate student. If I had it to do over again, knowing what I know now, I doubt I’d make the decision to study journalism again, because the news industry—both in China and in the U.S.—seems to be a world designed to keep people like me out. It’s hard for Western-educated Chinese students to practice journalism properly back home. In a country where the media environment remains one of the most restrictive in the world, the journalistic skills and ethics I learned in the U.S. don’t transfer to jobs in domestic media easily. Thanks to mounting censorship, it is nearly impossible for journalists to dig into critical political, economic, and social issues beyond the increasingly narrow parameters set by the government. If we could work as full-fledged journalists for non-Chinese media outlets, that might be a viable alternative. But China’s government only allows Chinese nationals to do “auxiliary work” for foreign media, as assistants or researchers. Across the pond, it is tough for any foreign national to land a job in the U.S., but the odds against Chinese journalists are even longer: language barriers; cultural differences; communication hurdles; a lack of familiarity with cultural cues, social issues, and political affairs; a different mindset to adjust to. . . The list goes on and on. I am forever grateful for my 19 months as a news assistant in Beijing; I grew professionally and produced some work that I was proud of. What I didn’t expect as a naive Chinese student, though, were the restrictions imposed on Chinese citizens working for foreign media, and the hierarchy and discrimination—both overt and subtle—I encountered. Sometimes when we were out reporting, people would point at me, referring to me as “that little Chinese translator” (which was indeed part of my job) or saying I was a “running dog” for foreigners. We Chinese news assistants were on a different payroll and benefit system from our foreign colleagues. Chinese rules dictated that we register with the Beijing Service Bureau for Diplomatic Missions, an agency of China’s Ministry of Foreign Affairs, in order to take the jobs, and this Bureau was technically our employer. I learned much later that to our actual employers we were “temporary employees.” On paper, we were not categorized as journalists nor as formal company employees. The author (left) and a colleague interview Chinese fashion designer Guo Pei, February 28, 2016. If this had been the only problem, I might have just taken it in stride. After all, I was a junior foreign female worker at the bottom rung of a large corporation. But what made me seriously wonder if I could keep going was the fear of repercussions for myself and my family when working on stories deemed sensitive or negative by the government. A recent article in Quartz described the situation well: Chinese employees at foreign news bureaus work in anonymity, even while they often do the lion’s share of the work and then face the lion’s share of the pressure from government security agents. In the worst cases, they can face prison terms. I realized these structural problems and the resulting frustrations had stifled my motivation and career mobility. So I decided to leave China to attend the Medill School of Journalism. Unlike in college when I’d been just trying journalism out to see if I liked it, now I knew that deep down I relished the work and its professional challenges. I wanted to get better at it. Sure, I knew many of my Chinese journalist friends were leaving the field for other kinds of work. But I figured at Medill, I’d be able to learn and continue reporting for at least a year with peace of mind. After that, I’d figure something out. Now I see my decision to study journalism as reckless. And I’m not alone. My impression is that the number of Chinese students coming to the U.S. to study journalism is rising, even if their ranks are dwarfed by the influx of Chinese students in business or STEM fields. I was one of the few Chinese students in my undergraduate journalism program at Iowa. At Medill, about 17 percent of the students in my Master’s cohort came from China. While specific data on Chinese students studying journalism in the U.S. have not been released, according to the Institute of International Education some 21,913 international students studied journalism and communications in the U.S. in 2016-2017. Although they made up for just 2 percent of the overall international student population, the number more than doubled what it had been 10 years earlier. China has been the top source of international students enrolled in American universities and colleges since 2008. Despite the many obstacles to working as journalists that they will inevitably face, I have observed more and more Chinese students are signing up. The year I spent at Medill turned out to be the best of my not-yet-so-lengthy adult life. I stumbled on business journalism and got hooked on the subject of money, a topic I had not only found uninteresting but had actively disdained. I did video work that I’d known I was good at but never had a chance to try at my previous job. It wasn’t until the last three months at graduate school when I started to worry about returning to the real world—and getting a job. Most U.S. media companies rarely hire foreign nationals. It may be hard to justify hiring non-native English-speakers for jobs requiring exceptional communication and writing skills. H-1B work visas are expensive and issued through a lottery system. I was well aware of all this before coming back to the U.S. in 2016 for my Master’s. But I didn’t anticipate Donald Trump would become president. Now it’s becoming even trickier for foreigners to break into the field due to the increasing uncertainty around immigration policy. In his 2017 “Buy American and Hire American” executive order, Trump suggested that H-1B visas should be harder to get. The number of H-1B applications reportedly dropped last year for the first time since 2014. Immigration lawyers interviewed by CNNMoney said it was not surprising companies were sponsoring fewer foreign workers due to policy uncertainty and heavier scrutiny. The U.S. Citizenship and Immigration Services said in a February policy memo it will require more information about H-1B applicants’ employment to prove the workers are qualified for their jobs. In fact, in 2017 the agency issued more “requests for evidence” (RFEs), challenges sent to H-1B applicants requesting more information. Citing data from the U.S. Citizenship and Immigration Services, Reuters reported a 45 percent increase in RFEs issued to H-1B visa applicants between January 2017 and August 2017 compared to the same period in 2016. Jobs were, therefore, understandably, a touchy topic among my journalism school classmates. Everyone was anxious about their job prospects and, more importantly, about visa sponsorship. Journalism schools have outplacement offices, but they don’t have much advice to offer international students—their number have always been scant, and finding jobs in journalism is a tough proposition for anyone these days. The cynic in me thinks the people who leave journalism for finance, data analytics, or any other field are probably making smarter choices. But the idealistic me hopes that one day Chinese journalists will be able to cover our own country (China will be an important story to tell for years to come and it could really use our reporting) and other parts of the world effectively and professionally for international news outlets—just as our Western counterparts have been doing for decades. So I began to hunt for work. I was surprised when a university career-service advisor told me to leave my nationality out of cover letters so as to eliminate the chance of my applications being scrapped before even being considered. I wondered what recruiters would think when they saw my name. Later, I learned that the same advisor suggested another Chinese student, a permanent U.S. resident, change her first name to an “American” one to help her prospects. It is not that my nationality or my name is so sacred as to be untouchable, but they are part of who I am. I couldn’t wish my identity away if I wanted to, and I doubt I’d want to work for someone who views me negatively because of where I come from. Knowing that I had a far smaller likelihood of getting hired in media than my American peers, I applied to as many outlets as I could. I went on a slew of interviews in the summer, anxiously awaiting that ultimate killer question about my visa status. It took me a good while to be able to answer with confidence that I DO need sponsorship. Among the couple of media outlets that turned me down, some explained that they passed me over due to visa barriers. Others didn’t specify, but I wasn’t sure I really wanted to know why. Conventional wisdom says international students should never bring up the deal-breaker question of visa sponsorship during the first interview; they should always wait for the interviewer to ask. But at some of those dreaded interviews where it was clear we were not a fit for each other, I’d voluntarily kill the deal by asking bluntly whether the company would sponsor me for a work visa. Ridiculous as it was, squandering those opportunities gave me a rare sense of control. I was, and I still am, reminded every day that I am a foreigner in this country, disadvantaged in so many ways while facing very limited job opportunities. But I have to deal with my choice. I also try not to come across as a whiner, as I am fully aware that tens of thousands of other foreign journalists have gone through similar frustration and exhaustion. I am by no means special. At trying moments when I felt as if every door was slammed against me, that harsh voice of the Chinese classmate from my Iowa days came back to haunt me. I doubted my writing abilities, my language skills, my knowledge of this country—my credibility overall as a foreign reporter. I wondered whether it was silly of me to pursue reporting jobs. After all, I could have pivoted to video like many other international students have. Worse yet, there was a terrible feeling that I had nothing to leverage with, as if my bilingualism, multicultural background, and, what I pride the most—my perspective—didn’t count. Finally, I made peace with myself: If I’d really wanted to be practical and needed a guarantee of a job, I’d have studied engineering or actuarial science. But I’d decided to try something harder, and now my fear of failing at it motivates me to explore the unknown, to report and write in a foreign land in a language that is not my own. Today, I am working at a personal finance publication, where I use neither my multicultural background nor my bilingualism. I live through the terror of self-doubt every single day, but I survive because of the great joy I derive from telling stories of human and financial complexities. I also cherish greatly the freedom of reporting on issues not so close to home. With a little more distance from my subjects, I can see things from outside in, not inside out as I was reporting on China. The detachment gives me more room to think and tinker as a journalist. I’ve now lived through several years when everything has felt temporary and uncertain: jobs, apartments, the future. I am in that situation again as I wait to find out if I will receive an H-1B visa, which my employer has agreed to sponsor. Every morning I wake up with no I idea where I will be in six months. The U.S. Citizenship and Immigration Services in 2017 received 199,000 H-1B visa applications. But the annual cap for regular applicants is 65,000, plus an additional quota of 20,000 for people with advanced degrees. This week, the U.S. Citizenship and Immigration Services began accepting H-1B applications for Fiscal Year 2019. I’ll be lucky if I make it. Otherwise, I’ll not only have to leave the country, but probably journalism as well. The road is long and bumpy. I don’t regret a bit of it, but I hope the path for future Chinese journalists will be easier.